Welcome to the Awarding You Video Library. Here we've assembled a variety of tips, ideas, and information to help you as you develop your awards program. 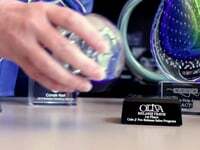 If you're thinking about a custom award for your organization, here's a great overview of everything you need to know to get started on your project. Awarding You has helped thousands of organizations create custom awards to recognize teams, volunteers, managers, and many more. When you'd like to add another image to your award, here are some tips and options to help make your next award picture perfect. When it's time to order the next nameplate for your perpetual plaque, here's everything you'll need to know! We couldn't resist an out takes video...so, here's "a little peak behind the curtains" from this team's video production. 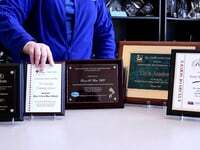 Are you looking to add perpetual plaques to your awards program? Here's everything you'll need to know as you decide what option will work best for you. When you have a need for low cost awards and gift items, Awarding You offers an array of beuatiful value priced items to meet your needs. 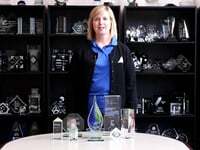 From paperweights to small glass and crystal items, we can provide you with ideas and options for every project. Every now and then you may need an award that is manufactured in the USA. Awarding You offers a variety of awards that you can use for these requirements. 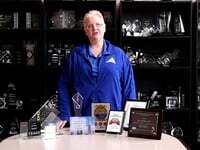 Here's an overview of our American Made awards. There are hundreds (well actually thousands) of award and gifts options at Awarding You. Here's a quick overview of some of the basic award shapes to help you determine what might work best for your next awards program. When you're looking for some smaller, desktop award and gift options, Awarding You offers many products that can meet this requirement. Here's an overview on some of our many desktop items and how to find these types of items on our website. Awarding You offers silver color fill on some of our award and gift items. Learn what this is, when it's used and how to tell if it's offered on the awards or gifts you've chosen for your program. Awarding You offers some ideas and options for wording your awards and gift items. 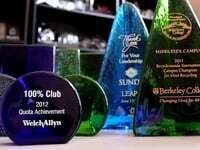 Glass Awards come in a variety of shapes, sizes and colors. One of the most colors of glass is jade, a soft green tinted color glass. 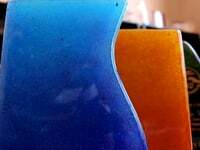 Here Awarding You offers an overview of what Jade Glass is, how it's different from clear glass, and the types of awards that it used to create. Awarding You carries two types of crystal awards: lead crystal and optic crystal. So what's the difference? Here's a quick overview on how crystal is made, the difference between these two materials, and what awards and gifts are made of the materials. 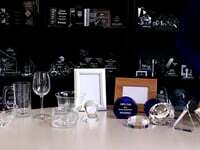 Many glass and crystal awards and gifts have engraved text with the company logo, recipient names, dates, and award information. Engraved text is elegant and timeless. But there are times when you'd like to have your logo in color on your award. Here's an overview of what options Awarding You offers for providing your logo in color for your awards. 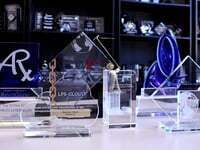 Awarding You offers hundreds of award and gift designs in glass and crystal materials. 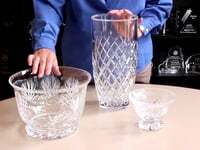 Learn about the difference between glass and crystal, how they are made, and some of the many options available. Art glass awards are great addition to every awards program. 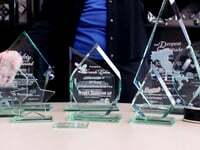 With their beautiful colors and unique designs, these awards make a great impression on the many deserving recipients in your organization. 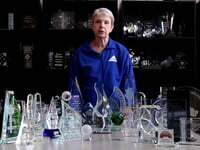 Learn a little more about how Art Glass awards are made. 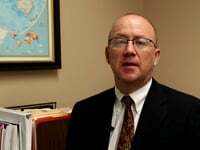 Meet Gary Tinker, the President and Founder of National Engravers, Inc, the parent company of Awarding You. What was the idea behind starting this company, what have been the founding principles of the organization, and what are the company's plans for the future. 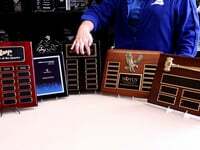 Just in case you're curious about the boxes that your awards, gifts or plaques come in, this video will give you a quick overview of the typical boxes that Awarding You uses to protect your award. Standard, Premium, and Upgraded options are shown as well as packaging for plaques. If you've ever wondered how plaque awards are made, what components are used, and the basic terminology for plaques, this video is for you. Awarding You designs and manufactures hundreds of plaques every week for clients around the globe. Get a quick overview of how your plaques will be made. See how Awarding You packages your award order for shipment. With over 20 years experience, we have designed a packaging system that ensures your awards and gifts will arrive in excellent condition. When you'd like to add an eco-friendly award to your event or awards program, Awarding You offers many options to meet this requirement. 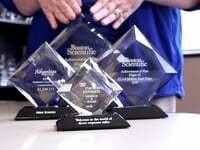 Are you looking to create a "family of awards" for your awards program? 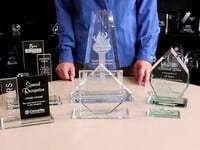 This video gives you an overview of ideas and options when you want to create a great looking family of awards for your event or program.